The best gift I ever received was a leather bound journal from my brother. He brought it back from his trip to Rome and gave it to me towards the end of my gap year in Israel. I had recently begun keeping a journal after high school graduation, diligently recording the daily events and the thoughts and emotions they elicited on the lined pages of spiral bound notebooks I had found in my desk drawer. . The journal is stunning. Its smooth brown leather cover has the words Carpe Diem (seize the day) emblazoned in gold, and the pages are a thick milky white which makes the color of my pen pop. But its beauty is not what made the gift so special to me. In every bookstore I pass as I walk through New York City on my way to school, one can find leather bound notebooks which look as if they are imported from Europe. They smell just as authentic and would serve just as well as a place for me to write and contemplate my life happenings. What made the journal so great, was what it meant coming from my brother, and the lasting effect that it will have on my life. My year in Israel was one of intense growth and maturation. I spent it studying Talmud on a Kibbutz, reading books of Jewish thought and history, and traveling around the country that is my homeland as a Jew. Over the course of the year, I had many conversations with my brother about all that I was learning, and how keeping it in a journal solidified those experiences as part of my life and not just fleeting emotions, thoughts, or experiences that would fade once the moment had left. I truly did want to seize every day and take advantage of the incredible opportunity I had to study in Israel before I began my undergraduate degree. These conversations brought my brother and me closer and deepened the relationship we had as siblings. All of this was reflected in the moment he gave me the gift. It showed me that he wanted to have a part, however small, in the growth that I was experiencing and also cared that I continue to learn and grow in the future. The timing, just a few months before I was set to return home — certainly not enough time to write through an entire journal, showed that he cared that I continue to gain the most from my experiences even after I left the confines of my gap year. The journal was a gift that gave me the warm feeling which gifts tend to do in the moment in which I received it, and I continue to have that feeling every time I open the now slightly worn and tattered cover and begin to write. It was a gift that kept on giving. Since the holiday season has arrived and Chanukah is coming near, I have begun to think about gifts I can get for those that I love which will elicit the same feelings in them which I had upon receiving the journal from my brother. The JGift from JScreen is that gift. Giving a certificate for JScreen genetic testing this holiday season will show those you love that you care not only about them today, but that you are invested in their health and happiness and that of their family. Genetic testing impacts an individual, their partner, and the lives of their children, and by giving a JGift, one can show those they love that they are invested in their future. It is a gift that never stops giving. Lilly Gelman is one of JScreen’s Fall interns. Originally from Houston, Texas, Lilly Is currently studying Biology and English at Yeshiva University. 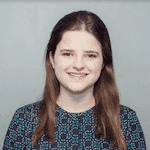 In addition to her work with JScreen, Lilly is also an editor for The Commentator, the student newspaper of Yeshiva University, and Perspective, the first online magazine of Stern College.